Hats off : The new Hofkapelle of Weimar is experiencing a meteoric rise. 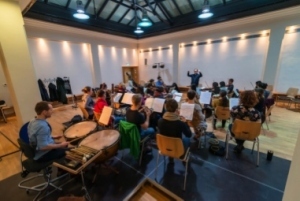 Founded in 2009 the new ensemble brings together most inspired young artists from Germany’s leading conservatories and orchestras in a series of „academies“, to give enthusiastic and thrilling performances of highly demanding programmes. The history of the ancient court orchestra sets a great example in reconciling Baroque and modern performance practice. With great intensity of emotion, fidelity and thoroughness of their musical approach the chamber orchestra makes its name standing for historically informed, extremely passionate and authentic musical events. The enthusiasm of the new „Hofkapelle of Weimar“ embraces a wide range of music, from Bach cantatas to recently rediscovered symphonic works by leading pupils of Franz Liszt, who had Weimar as their common destination. The new Hofkapelle of Weimar has the courage, the indefinite curiosity and the absolute honesty to tackle unique, hitherto unedited works, alongside Classical standards, with self motivated passion - having newly discovered them and let them speak for itself. In his responsibility as artistic director Peter Hörr charts the course of a chamber - music stream. „Elastic, borne along by great enthusiasm“ was the press reaction to their first performances. The new Hofkapelle of Weimar won the most renowned european ECHO Klassik prize for their world premiere recording of J.L. Duport cello concertos in 2010. Pro Arte Musicae Co. Ltd.